These new rules will allow Customs personnel to randomly open these packages. With the Bureau reputed to be one of the most corrupt (allegedly) agencies in the Philippines, many think the new rule is tantamount to opening your bag to pickpockets. 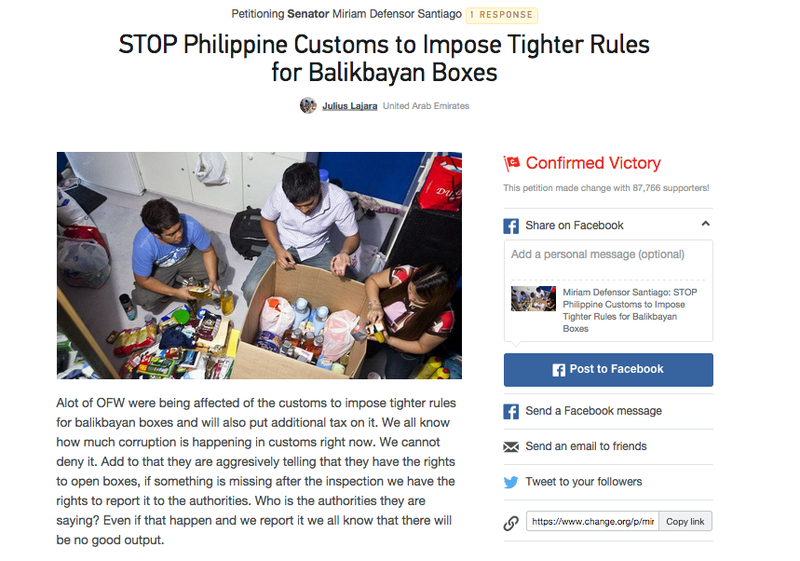 Balikbayan boxes are packages sent home by Overseas Filipino workers (OFW) and are subject to certain tax privileges. How is this related to the economy? The OFWs are the main source of foreign exchange in the Philippines, since the country does not really have any notable exports. See the petition here. Next is a tweet about the Philippines Q2 growth. Not a lot of interest in this tweet! 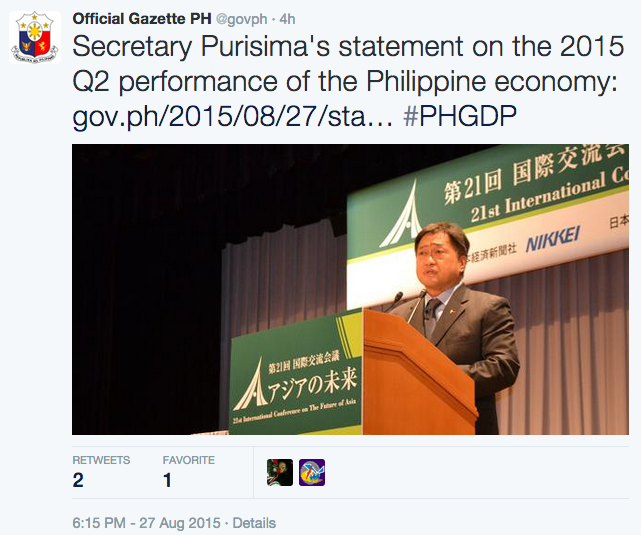 Tweet on Secretary of Finance Cesar Purisima’s statement on the economy’s Q2 growth. Screengrab from official gazette PH twitter account. The economy grew by 5.6%. in the 2nd quarter, and you would expect that people will actually care about what the secretary of finance says about it. People in social media didn’t. Read the finance secretary’s statement here. Investors cared about the Q2 growth report though. After a disastrous Black Monday (August 24), the PSEi bounced back to above7,000 points following the Q2 growth announcement on Wednesday. Recovery or just a detour to bear town? PSEi bounces back to above the 7,000 mark. Screengrab from Philippine Stock Exchange twitter account. With the PSEi bouncing back, the path to bear territory was (temporarily?) averted. See the graph of the performance of PSEi here. With the markets in decline and an increased in volatility, investors become nervous. 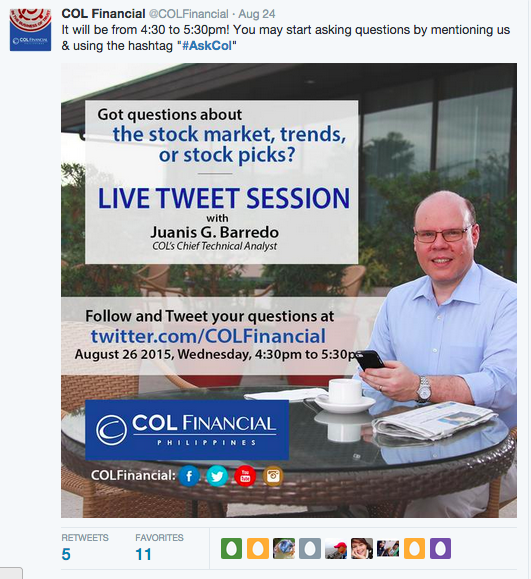 COL Financial hosted a Q and A twitter session with Juanis Barredo, COL’s chief technical analyst on August 26. Based from the twitter timeline, the tweet session went well but many questions were not answered due to lack of time. Many of the questions were also about specific stocks, which was difficult to answer off the cuff. Kudos to Mr. Barredo for being able to pull out charts to explain his answers about certain stocks. See parts of the tweet session here. The Asia Pacific Economic Cooperation (APEC) 2015 will culminate in the economic leaders meeting in November in Cebu, Philippines, but many of the strategic meetings are already taking place. 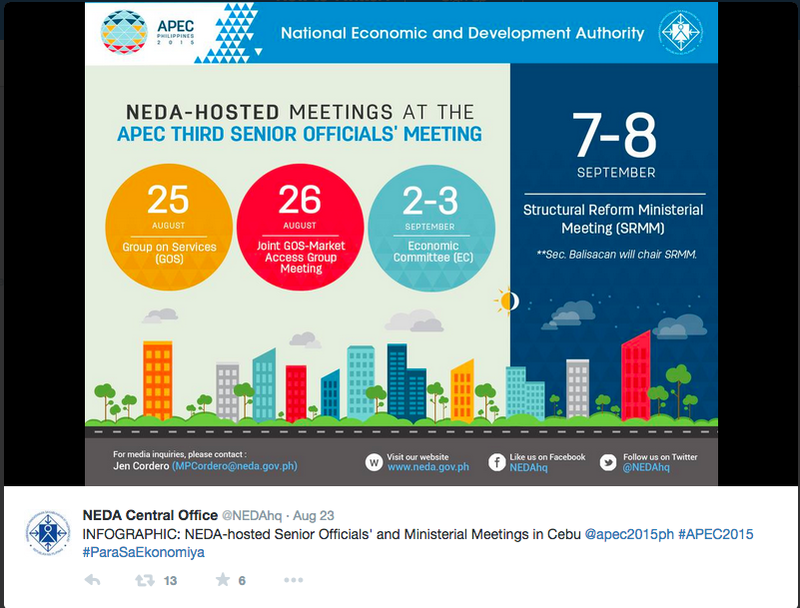 The National Economic Development Authority (NEDA) posted an infographic of APEC 2015 related meetings. The use of the hashtag #ParaSaEkonomiya is appropriate here. Sadly, this hashtag has been used as a punchline for many tweets. See the various tweets here. Although not directly related to the economy, one tweet with the hashtag #ParaSaEkonomiya made a lot of sense. There’s a lot at stake at the 2016 Presidential elections in the Philippines. The economy being one of them. Everyone eligible to vote should – #ParaSaEkonomiya indeed. 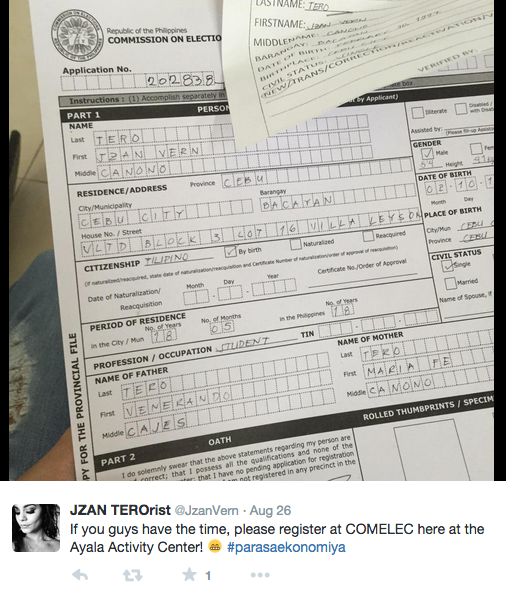 Next Next post: Did Cebu Pacific Cash In On the AlDub Phenomenon Without Paying or Even Asking for Permission?